Contains affiliate links. See disclosure policy for more information. If you’re a parent then you know that kids require a new wardrobe basically every season. This can cause a huge strain on the budget if you’re not careful. 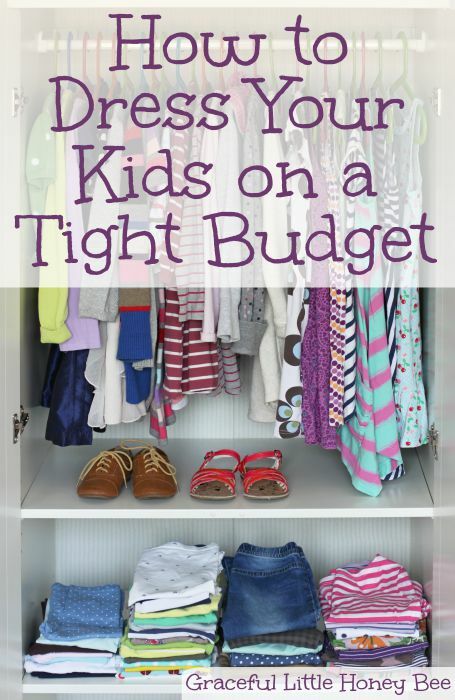 So today I’m sharing with you some money-saving tips for how to dress your kids on a tight budget. Thrift stores are great for finding inexpensive quality kids clothing, but you will need to follow a few rules: Make a list and only buy the best quality. You will be tempted by the racks and racks of cheap clothing, but if you want the clothes to last you will need to be picky about what you buy. I normally spend $1-2 per item at thrift stores. Doing a quick google search will probably be the best way to find consignment sales or stores in your area. These are GrEaT for finding quality clothes on the cheap. The prices will probably be higher than the thrift store, but they should be better organized with a larger more high quality selection to choose from. I normally spend $2-3 per item at consignment stores. -Sell clothing your child has outgrown here to make money towards the clothes that they need. -Ask the sales associate if they have a mailing list so you can be notified of upcoming sales/events. I haven’t had much luck buying clothes on Craigslist because the selection is usually pretty limited and I’m picky, but it’s worth it to check your area listings just in case! I have however, found some expensive name brand pieces on Ebay for AmAzInG prices. This is great for moms who don’t have the option to go around shopping at thrift stores all the time. I’ve found awesome prices on big pieces such as winter coats and ski bibs. Garage sales are awesome for finding quality clothes at really cheap prices (think .25-$1 a piece!! ), but you need to invest time and energy into finding the best sales, because a lot of the time (if you’re being picky!) you will walk away empty-handed. In this season of life I don’t have the time or extra arms it would require to haul my kids around every weekend trying to find the best sales, but I look forward to being able to do that in the future! I’ve found that the best times to buy summer clothes are July/August and the best times to buy winter clothes are January/February. This is when the stores are clearing out their inventory to make room for the next season. To make this work you will need to look ahead and buy next years summer or winter wardrobe at the end of this summer or winter. Make sure you are on your favorite stores mailing lists so you can be notified of their end of season sales and can print any coupons that they might send. The best savings are when you match a sale with a coupon. Target, Kohl’s and Children’s Place are great for finding new clothes at a great price if you shop at the right times. When buying new clothes I try not to spend more than $5 per item, but it’s not uncommon to find things around $2-3 per item. What’s your best money-saving tip for buying kids clothes? Charity shops were not the place to go when my kids were little, it had a stigma attached. Now it is more acceptable, even part of society to browse in charity shops and on selling sites to get some great bargains. I am a SAHM and love your website and enjoy your recipe ideas I receive in my email. Thrift stores, eBay and Garage sales are my favorites. I wish we lived near a good consignment shop (I.e. "Other Mothers" is awesome-near my parents house...only three and half hours away LOL). It is true about holding onto a great source for hand-me-downs. I have two children: the oldest is a girl, the youngest is a boy; therefore hand-me-downs in our immediate family are not possible. However, my husband's co-worker has a daughter one year older than mine, so we get her hand-me-downs every season. She never wants money for them, but I always send a very grateful thank-you card to her. For my son, hand-me-downs usually come from our nephews. Great website! I usually ask friends and family to buy my daughter an outfits or a dress for her birthday and for Christmas. Thank you for catching those errors! I only buy my boys two pair of jeans each time they outgrow them. keep one pair washed when they start getting two short only buy two more. I discovered Facebook yard sale groups shortly after my daughter was born last year and you can get great quality stuff in bulk for cheap cheap cheap!! I've saved hundreds on baby items and clothes going through yard sale groups. School uniforms, usually around this time (End of August) are on sale. Basics, like khaki pants and polos, and skorts. Even activewear. The kids change into play clothes when they go outside to cut down on staining and reducing wear on 'nice' clothes. The Children's Place is a nice place for inexpensive uniforms. I like to use the 'capsule wardrobe' idea! So minimal pieces that make multiple outfits!